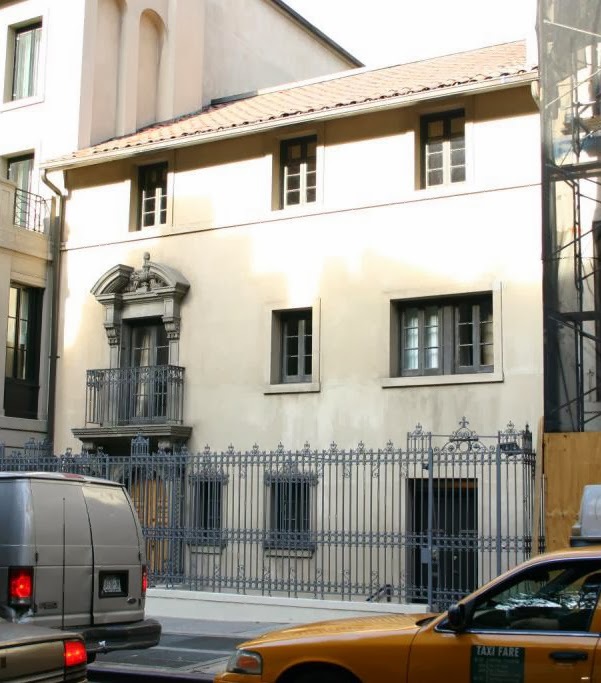 ...The lady property gossip at the New York Post has let the celebrity cat out of the real estate bag about how two-time Oscar-nominated film director Spike Lee listed his pedigreed, Spanish (Colonial) Renaissance/Revival-style townhouse mansion in Manhattan on the market with a huge but hardly unheard of $32 million asking price. The original owner was a female member of the illustrious Vanderbilt family who married a man named Hatch, hence the residence's long-standing designation—at least to those who pay attention to such things—as Hatch House. Later owners of Hatch House, as listed in detail in The Post, by the kids at Curbed, and on the deliciously informative Daytonian in Manhattan, included burlesque superstar Gypsy Rose Lee and A-list artist Jasper Johns. It was Mister Johns who sold it to Mister Lee in 1998 for, as per at least one digitally accessible property record database, a bit more than $16.5 million. Not for some looking but Your Mama has yet to turn up a digital listing for the impressive residence so, for now, details of its current configuration and decorative aspect remain a mouth-watering mystery. Previous descriptions of the property say it was built in the late-1910s, has 8,292 square feet arranged around a central courtyard with fountain. At the time the house was occupied by Gypsy Rose Lee—that would have been sometime between 1940 and 1970—The Old Grey Lady Herself revealed the 26-room edifice had seven bathrooms, a marble-floor living room, and gold monograms on the doors. Decades and several owners later, in 2008, the Old Grey Lady Herself once again briefly described the Lee residence as in "near-original shape." Fascinating stuff, for sure. Your Mama would probably let our occasionally vengeful house gurl Svetlana run us right over with a Cadillac or maybe even an old Pontiac iffin that would mean we could see the floor plan and listing photos right now, wouldn't you? It would seem that the rats are jumping off the NYC ship? Isn't 32 milli a bit overpriced? This early 20th century Spanish style is suuuuuper rare in NYC, Mama Lama. Like a mansion full of natural blondes. Rabbi, We read the links here. You're stating the obvious. Looks like the outside of a prison. Cell block 16. FEMALE MEMBER???? Seriously? why not just member? Please stop typing the word female where it isn't needed. it is very sexist. Mama didn't talk down to women why does the current writer? ...a Pontiac? Not so much. and you know it wouldn't be bad to simply use the term women when refering to a women. its when u put the word female in front of a gender neutral term that you go horribly wrong. mama what about kimmy big booty and DR DRE?????? For the moment it will have to remain a dark horse. Sure I'm not the only one curious about what's behind that door. The interiors of the Lee house were published in Town & Country magazine (yes,really!) and later in the book "At home with Town and Country" by Sarah Medford. Behind that facade is a very fine home indeed! Spike is selling his home for $32MM and yet is asking for funds via Kickstarter for his next film. Unbelievable.